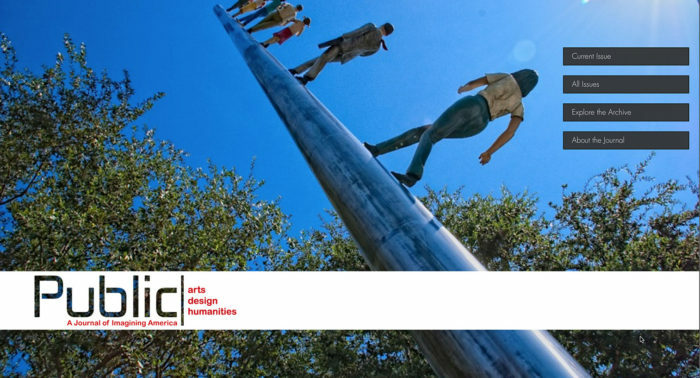 This issue of Public: A Journal of Imagining America focuses on implications and mechanics of civically engaged research, teaching, and creative practice across national boundaries. What does it mean to be “globally engaged?” What principles guide the building and sustaining of equitable relationships with international partners? What opportunities and challenges can/do international engagement partnerships present? What are the politics of framing and funding engaged arts, humanities, and design projects abroad? How do we recognize global engagement that is an extension of colonialism: “beneficent” projects that “bring civilization” to communities seen as eternal victims or as primitives? How do we enact a paradigm grounded in two-way projects aimed at bringing various populations’ epistemologies, semiotic paradigms, theories, and philosophies into scholarly and public discourse within and beyond their nations? “Blackness Through a Dual Lens: A Caribbean Journey into the African American Experience” by Catherine Amelia John-Camara, using personal narrative to explore what “Blackness” means in both US and Caribbean contexts; the distinct intersections of color and class in Jamaica; anxieties about culture, race, and authenticity in the US; and African American encounters in Caribbean spaces. “Reflected Borderlands—Newark/Sejny,” by Ian Watson, examines the influence of the Borderland Foundation on a community-engaged initiative developed by the Department of Arts, Culture and Media, Rutgers University-Newark, with Youth Build, a local organization in a nearby under-resourced community. Watson describes being broadly inspired by his international experience of Borderlands without over-simply trying to copy it in Newark. “Educating the Citizen Scholar in the South African Writing Class: Insights from Three US Writing Teachers,” by Pamela Catherine Nichols, analyzes what the struggle of three US author/educators to bring a more equitable and dialogic model to South African schools and universities reveals about the ideology imbedded in apartheid pedagogy. “Hemispheric Engagements: Pedagogy of the Stones,” Olivia Gagnon’s interview with Hemispheric Institute of Performance and Politics director Diana Taylor, emphasizing the importance of situated knowledge, collaborative pedagogy, and embodied practice; the problematics of access; and the creation of political environments for engaged learning and cross-cultural collaboration. “Staging Digital Portobelo: Humanities Scholarship, Digital Tools, and Collaboration as Acts of Persistent Translation,” Renee Alexander Craft and Pamella R. Lach’s use of digital rubrics to reflect the dynamism of community-engaged scholarship and extend their collaborative potential, expanding upon as well as challenging the notion of “open-access,” particularly in its attempts to span the digital divide. The issue’s second section, Case Studies, foregrounds university-based globally engaged design programs. Study abroad programs have long been part of higher education. According to the US Department of Education, more than 80,000 American university students study abroad each academic year (2015). A small yet significant number of such programs have adopted a community-engaged or service-learning model, distinct from the more traditional travel or foreign study program that is not likely to engage formally with local communities. What are the actual outcomes in terms of pedagogical and community benefits of such deliberate programs? How can/do/should we shift our pedagogical approaches when involving students in international engagement? What do we want our students to learn? How can we shape our projects and articulate them to and with our students and partners to make these outcomes more likely? What are the advantages and disadvantages of framing this work as service-learning, study abroad, fieldwork, or a summer research opportunity? Each of this section’s submissions addresses a particular facet of the challenges facing community-engaged study abroad programs today. In “Transferred, Translated, Transformed: Design Tools for Student Engagement in Ghana, West Africa,” Kofi Boone examines how his program’s pedagogical and community-engagement approach has evolved over two decades, from a traditional, formal, instructor-centered model toward a more fluid and collaborative experience that highlights the subjectivity and agency of students and community participants in shaping the participatory learning experience. Such evolution parallels the development of service-learning practices in community design and planning, going from a technical assistance model to one of community-university partnership. Boone describes and reflects upon specific techniques that were developed and utilized in the program in order to facilitate the process of cross-cultural learning and cocreative activities. In “Amplifying the Ingenuity of Community Self-Organization: A Collaborative design Workshop in Shanghai, China,” Mingjie Zhu, Minqing Ni, Kin Wai Michael Siu, and Dongjing Song describe a design project with students from several universities carried out in close collaboration with a housing-based elderly community in Shanghai. The authors examine the outcomes of student learning and the dynamics of collaboration between domestic and foreign students as well as participating community members. Based on an assessment using questionnaires and semi-structured interviews, they identify the need for more informal activities to bring community members and students together, an asset-based approach that recognizes and builds on the skills, knowledge, and resources of the local community; recognition and management uncertainty in the cocreative process; and the need to develop culturally sensitive and appropriate research and design methods. While addressing different challenges and opportunities of community-engaged study programs, each of these case studies also raises additional questions. For example, to truly assess the outcomes of community-based learning, it would be necessary to incorporate community inputs. Similarly, more assessment needs to be done in order to ascertain whether and how these programs benefit the local community. For programs involving students from multiple universities and countries, how do the students learn from each other? As in the Shanghai case, what are the implications of an international corporation paying for community-engagement projects? As more schools seek sponsorship and support to run international programs that require significant financial resources, questions like these will become only more relevant. In the face of cultural barriers and differences in expectations, motivations, and understanding, community-engaged study abroad programs are fraught with ethical and pedagogical issues, not to mention logistical and practical challenges. These programs tend to work with underserved communities that are vulnerable to exploitation and manipulation, whether intended or unintended. As it’s often difficult to prepare students fully for the rich cultural experiences abroad, especially in the context of underserved communities, care is needed to manage the process of engagement and collaboration. In such contexts, critical and candid reflections and assessments, as demonstrated in this issue, advance our practice and underline the interests of local communities. In our effort to better engage with, learn from, and even empower local communities, it is important to ensure that instructors and students have the competency and capacity to do so by building on past and current lessons from the field. The final section, composed of three reviews, each taking on global subjects, round out the issue. Enjoy! Walking to the Sky by Jonathan Borofsky – Nasher Sculpture Center, Dallas, 2009.